1. 100% cotton, eco-friendly material makes this sweater soft to touch, ventilate and good to keep warm. 2. Elegant and equisite design. Black base color, big and small sequins attached on the sweater make it like night sky and stars, which looks noble and mysterious. The equisite metal buttons on front side makes it elegant. 3. Suitable for womem over 30 years old. Middle age women's dignified and elegance can be displayed. 4. Suitable for various occasions, formal or informal. Top choice gift for mom or the elder women. Packaging detail 1pc per polybag and suitabel pcs per carton or as customer's requirement. Direct supplier As a direct sweater manufacture in Dongguan China, We have both factory and marketing department to offer you more competitive price and good quality. Specialized and concentrated We have been in sweater line for 8 years and concentrated in producing all kinds of sweaters. All our sweaters are hot selling all over the world. 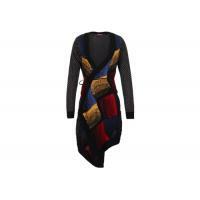 A variety of sweaters we can use all kinds of material to produce sweaters in different styles. 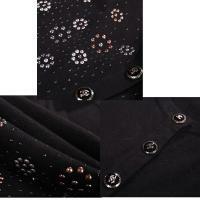 And all sweaters can have different decoration like embroidery, sequin, acid wash, woven fabric and so on. Best service our marketing department will reply your inquiry and questions on time and offer their professional suggestion for you to make great sweaters. Complete production equipment and departments From sweater knitting to packing, our sweater factory have 9 departments to work and control the quality. Dongguan Zhanya Knitwear Corporation Limited is an enterprise of industrial and commercial integration . Found in 2009 , Dongguan Zhanya Knitwear Corporation Limited has its own factory and trading department to produce and sell all kinds of women sweaters , men's sweaters and kids sweaters with different decoration like embroidery , beading , printing , crochet , acid wash , and so on . Being equipped with 50 full - automatic knitting machines for 12GG , 7GG , 20 linking machines , 12 pressing stands with vacuum and a full finishing line , our production capacity can reach 50000 pieces per month. With good own inner quality control system and professional service team, our sweaters for men , women and children are hot selling to different countries like ITALY , USA , UK , BRAZIL , SPAIN , RUSSIA , AUSTRALIA and so on . Our aim is to establish direct and long term business relationship with you and reduce the cost between us to achieve a win-win situation. Warmly welcome to visiting us.